A one-day training event organised and subsidised by NUJ South West in partnership with the West of Ireland branch. Andrea Martin, principal of MediaLawyer Solicitors, one of Ireland’s only specialist media and entertainment legal practices, will deliver a workshop on law and social media, copyright, privacy and other legal issues surrounding new media as well as a short addendum in relation to family law reporting. Andrea has previously worked as in-house legal advisor in RTE and as locum in-house solicitor at TG4. She is author of Quick Win Media Law Ireland: Answers to your top 100 Media Law Questions. PhD candidate in Digital Learning at the Clinton Institute for American Studies, UCD and former Head of Digital Marketing Education at The Shaw Academy, Matthew Wall will deliver a three-hour workshop on social media, source authentication in the digital space, EXIF data mining, HTML authenitication and location-based analysis of online data. Images, video, and text forms will be covered, as well as several software tools that can be used to speed this process along through large scale automation.The workshop will conclude with case studies and practical exercises. Places are strictly limited and bookings are now being accepted. To reserve your place send your name and phone number, indicating which event(s) you want to attend, to secretarynujsw@gmail.com. If the course is oversubscribed, a waiting list will be compiled. A new online directory of freelance journalists and photographers produced by the Irish South-West Branch of the National Union of Journalists (NUJ) was launched in Limerick by the Minister for Education and Skills, Jan O’Sullivan T.D. 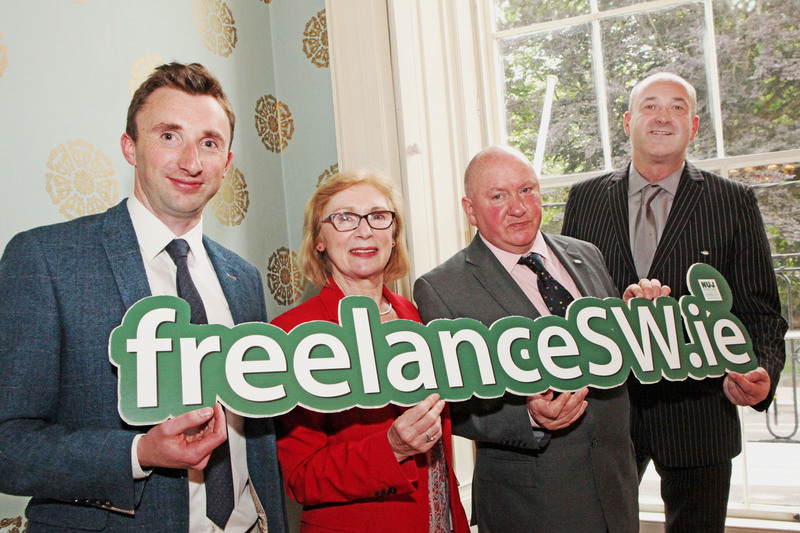 The first of its kind in Ireland, the new website, www.freelanceSW.ie, aims to provide a showcase for the Branch’s freelance members, who are all professional journalists and photographers. It is intended to be a one-stop-shop for any organisations or individuals seeking the services of a professional journalist or photographer in the region. Minister O’Sullivan complimented the South-West Branch of the NUJ on its initiative in developing the directory. “The directory is sleek, accessible and easy to use. It does exactly what it say on the tin and will allow the public, commissioning editors or busy news desks to instantly access the information they need. “In that way the directory is a great resource for NUJ South-West members who work freelance and will hopefully ensure greater prominence and more commissions for the talented group of journalists and photographers that we have here in the South-West,” the Minister commented. Minister O’Sullivan acknowledged that the traditional media sector had experienced a “perfect storm” in recent years due to falling advertising revenue, slipping readership figures and technological changes. “Although the methods of publication and consumption are changing rapidly, the principles of good journalism have not changed. Indeed, a credible argument can be made that they are probably needed now more than ever. “One of the great attributes of newspapers has been trust. You trust the journalists, the editorial team, the culture of a news organisation. As more and more information becomes available, I strongly believe that the issue of trust will again become central for consumers of news. That is why there is a bright future for journalism in Ireland. The skills of professional, ethical journalists and photographers, such as those represented by the National Union of Journalists, should not be outsourced or replaced by an app,” Minister O’Sullivan said. Branch Chairman Colm Ward thanked Minister Jan O’Sullivan for launching the initiative, noting that the Minister’s late father, Ted Gale, was a prominent Limerick journalist and active member of the South-West branch. Mr Ward stated: “Our freelance members – both journalists and photographers – are a vital part of our union and of our branch and we are very proud to be able to launch this directory outlining the great range of skills and experiences that they offer.